The current Jeep Grand Cherokee may be getting long in the tooth, but Jeep is doing quite a bit to keep it fresh for the next year or two until its replacement arrives, along with an even grander Grand Wagoneer. This of course also applies to that awesome, range-topping bastion of hedonism, the 475-hp Grand Cherokee SRT, which gets its own distinctive facial rejuvenation—hey, even guys are doing it these days—that includes a new front fascia, new grille, and fog lamps while it awaits a more powerful engine option next year. The look appears more contrived and less distinct than before, starting with the de-emphasis of Jeep’s signature seven-slot grille, which now appears as a skinny black graphic that joins the darkened headlamps. The fascia’s lower air intakes are more like those of the Dodge Charger SRT than a macho take on the Grand Cherokee’s familial look. 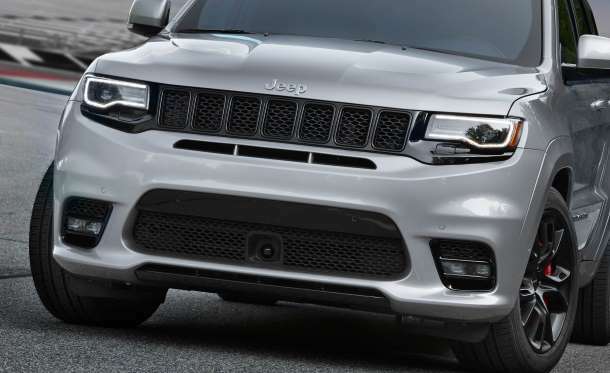 Whether the designers deliberately tried to conceal that it’s a Jeep, or whether they just got so focused on creating an SRT identity and managing airflow to cool its stonking powerplant that they inadvertently de-Jeeped the face, the result is the same. It’s all part of a Grand Cherokee facelift and a revised model lineup for 2017, including the introduction of the rugged Trailhawk model, an elevated Summit model, and new grilles across the board that made their first appearance on the 2016 Grand Cherokee 75th Anniversary Edition. The good news for SRT fans is that they left the barrel-chested 6.4-liter Hemi V-8, with all of its 475 horsepower and 470 lb-ft of twist, well enough alone. It pairs with an eight-speed automatic transmission with eight drive modes: Auto, Sport, Track, Snow, Tow, Custom, Eco, and Valet­. The Grand Cherokee remains the only SRT model that channels the fire-breathing grunt of that Hemi V-8 to all four wheels, further aided by launch control that optimizes the engine, transmission, driveline, stability control, and suspension calibrations for controlled hole shots. Regardless of how one feels about the SRT’s new look, we’re sure it’s as fun to drive as before. An even bigger change is coming for 2018, when the Hellcatted edition arrives using SRT’s supercharged Hemi V-8, rated at 707 horsepower in other FCA vehicles. It’s likely to be the most powerful SUV on the planet when it appears next July wearing the name Trackhawk. Until then, we’ll content ourselves with the 2017 SRT, which goes on sale this fall, starting at $67,790.